Ahhh Christmas nails, I love you so! For my last post before Christmas Day I thought I would sign off with a few Christmas Day Nail Ideas because even if you don't often paint your nails the big day is a great time to sport some super festive or glittery nails. I've tried to keep my glittery suggestions to a minimum are glitter nail polish is the worst to remove and no one wants to be sat wasting 30 minutes of their life post Christmas when they could be eating chocolate or creating a mini cheese platter (I'm sure that's not just me). So here is a mix of ideas that you can re-create/inspire you! 1. Subtle gold glitter nails - This nail polish is for the glitter lovers out there that hate the removal process of glitter nail polish as this is a fine glitter that is opaque on the nails but easy to remove! I absolutely love how the Avon Magic Effects Molten Metal nail polishes (£6 each - Avon brochure) look and the above gold one is my favourite. Rimmel do similar Precious Stone nail polishes if you want to get something like this before Christmas Day! 2. Glittertastic! - However if you don't mind the annoyance of removing glitter nail polish then a full of glitter like this Ciate Tinsel Town mini is the way to go. This mini is part of the Ciate Paint Pot Duo To Go set which you can find on Very for £12.99 here or ASOS have many single glitter mini polishes for £5.00 here. 3. Snowy scene nail art - On to some festive nail art now which was actually pretty easy to create! Here I simply started with a light blue base and using an old makeup sponge stippled white nail polish on the tips. Then to create the little trees I used a nail art brush and created messy Christmas tree shapes and then finally I used a dotting tool to add a little bit of snow. I love nail art like this that doesn't need to be neat as you can have it done in under 10 minutes while watching TV. Another favourite of mine is Christmas pudding nails as they are so so easy to do - lots of quick tutorials can be found on Google. 4. Easy red & silver polka dots - If you fancy doing a bit of nail art but just haven't the time or patience then this nail art is for you. 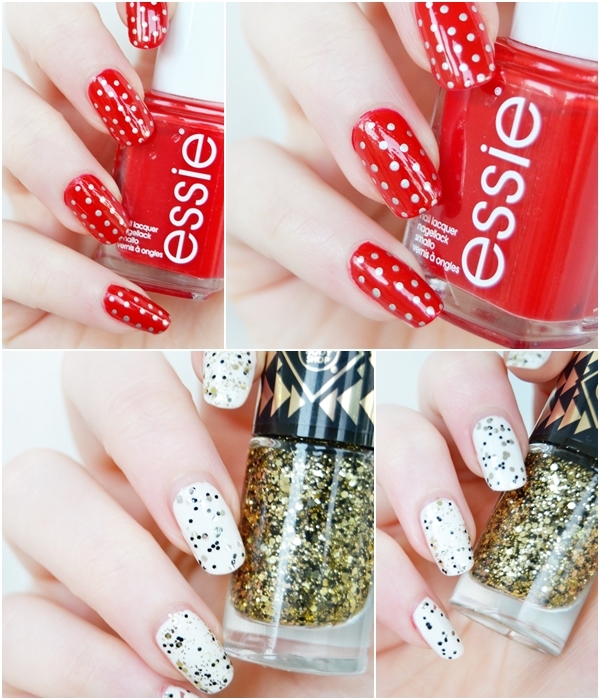 Here I've used Essie Russian Roulette as I love a vibrant red but you can use any base colour - white, black, green etc. Then you simply dot on the silver dots with a silver Sharpie pen! It really is that easy! My only tips would be to start with a vertical line of dots down the centre of your nails then work outwards for a neat look and to finish with a top coat as the Sharpie will wash off if you don't. Super easy and festive! 5. Salt & pepper glitter nails - Lastly for my Christmas Day nail ideas I thought I'd include another glitter favourite of mine, well two in fact. These two nail sequin nail polishes are limited edition at The Body Shop (£5.00 each) and can be worn as a single coat over the nails like I've done here or built up for an even glittery finish. I went for a white base but next time I think I will be trying the nail sequin nail polish over a gold or black base. Just really pretty and perfect for this time of year. 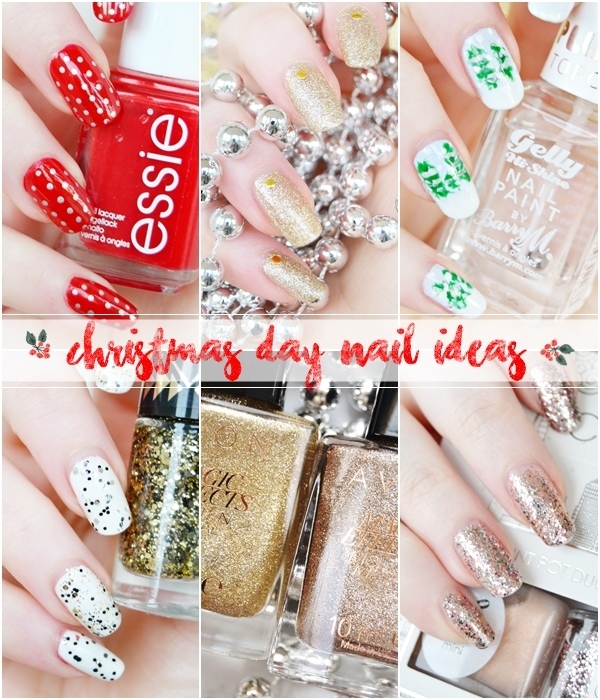 Hope this has given you a few nail ideas for your Christmas Day nails! As this is my last post before December 25th, I hope you all have a very lovely Christmas!